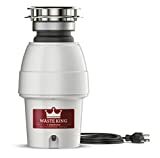 The Waste Maid 058 Economy 1/2 Horsepower Waste Disposer is a solid buy for those that need an economical replacement or first time food disposer in their kitchen. The compact design helps it fit almost any sink, the high speed motor ensures that even with the moderate amount of horsepower that the waste run through the disposer is ground perfectly. Along with the great overall performance is the anti-microbial Bio-Shield that reduces odors and the long lasting corrosion proof grinding chamber, which are both bonuses that can’t be ignored. 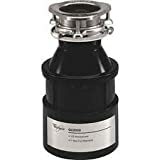 When considered along with the two year warranty, this disposer is worth every penny and then some. For a low horsepower model, achieving 2,600 rpm is no slouching matter. The speed of this motor ensures the grinding components are capable of handling the toughest food waste imaginable. Grinding through chicken bones, vegetables and table scraps is no problem for this motor. Learn more about things you can and can’t put into your waste disposal. The high speed rotation is possible because of the TorqueMaster Balance Grinding System. This system is a unique system that makes better use of the power available. It also makes the most efficient use of the motor possible. As a result, its 1/2 horsepower motor can get up to 2,600 rpm. Related: Which Size of Garbage Disposal Should I Choose? 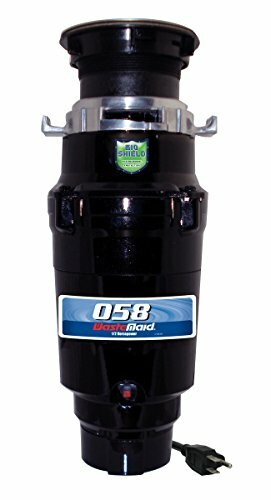 A great patented component that is only found in Waste Maid products, is the Bio-Shield built into the disposal. What causes most of the obnoxious smells that escape from a disposer is the bacteria that can grow on the ground material that may not all wash free. By adding the Bio-Shield to this Waste Maid disposer, it prevents that bacteria from being able to grow. Preventing that bacteria from being able to establish itself inside your disposal means that the odors that are frequently a part of other disposers never fill your home from this one. Here is other methods to remove odor from your garbage disposal. 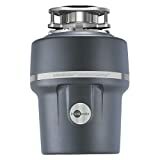 Since the Waste Maid 058 is made from such long lasting and durable materials, that means this disposer will provide years of work while it’s in place under your sink. The corrosion proof grinding chamber means you won’t have to fight with possibly harmful damage from the waste that you grind. The galvanized steel grinding components also offer an additional level of life extending construction. In many applications it’s been shown that galvanized steel can last for over 70 years, which means the grinding components could last for the rest of your lifetime. Check out other garbage disposal reviews for product comparison. Having the balanced permanent magnetic motor helps keep the noise level of the unit to a minimum. 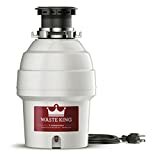 Nobody likes having a disposal that sounds like a jet taking off, and by replacing that old unit with the Waste Maid 058 you’re sure to cut down on the sound created by grinding food waste in your kitchen. The only items of issue we encountered while using the Waste Maid 058 were the small splash guard opening. With the opening being rather tight, water drains a bit more slowly through this disposer than we were used to. It also required a bit of extra force to push some of the large pieces of waste into the unit. The other issue was that the having such low horsepower means that this unit feels like it can become overloaded fairly easy. While the rpm’s are definitely up there, with too much waste in the system there is a noticeable amount of power loss, so it’s best to feed it smaller chunks of waste until you’re finished.